Despite a week of controversy over Representative Steve King’s comments mentioning white nationalism and white supremacy, it might seem odd that the Women’s March is getting relatively little attention for its own intolerance and radicalism. 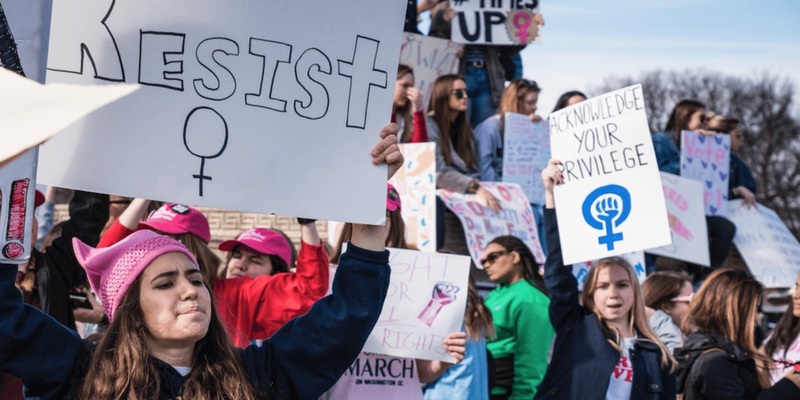 Over at The Federalist, Project 21 member Emery McClendon has written about the similarly disparate treatment of the Women’s March by the media and left-wing activists compared to how the Tea Party has been put under a microscope and intensely scrutinized. And there’s actually a lot more to be concerned about with regard the Women’s March! Funny how that happens. [W]hat’s happening with the Women’s March right now is similar to what the left claimed about the Tea Party ten years ago. The only difference is the reports this time appear to be true. Let’s go back to Representative King for a second. For his comments, he was quickly condemned by his colleagues – and experienced a quicker denunciation from his fellow conservatives. But that didn’t seem to be enough. A disgraced King was used as a cudgel to beat on the Trump Administration. In many ways, this was a repeat of when the Tea Party movement was in full swing. The left was quick to find any poor representation of the movement – no matter how small – and make that the focus. One Confederate flag was enough to tar-and-feather an entire event… and the movement as a whole. But over on the left, the actual leadership of the Women’s March was revealed to be quite hostile toward Judaism. One of those leaders called Nation of Islam Louis Farrakhan the “greatest of all time” on her Twitter account, and another is exceedingly anti-Israel. Some groups have pulled their support from the March – albeit quietly. But there’s no media firestorm like there is for King right now or about the Tea Party back in the day. Yet the NAACP, which was alarmed in 2010 that Tea Party organizations “have given platform to anti-Semites, racists and bigots,” remains a partner of the Women’s March despite all the reported antisemitism, racism, and bigotry associated with it. This is all in stark contrast to how the Tea Party movement was portrayed by the left. The Tea Party was held to a totally different standard regarding its events. Was it simply based on the Tea Party having conservative leanings while the Women’s March has progressive leanings? It appears to be so. The Tea Party was tagged as racist from its inception. Anytime a controversial person attended or a questionable sign was held up at a Tea Party event, there was an immediate call for accountability. If one person in thousands brought a Confederate flag, the NAACP wanted Tea Party leaders to repudiate those individuals as if they were invited to the podium. Critics even tried to label the Gadsden Flag, the Revolutionary War flag adopted by the Tea Party, as racist. Yet, in contrast, it took two years and multiple investigative articles and public pressure from celebrities to get the Women’s March to address public racism by its leaders. 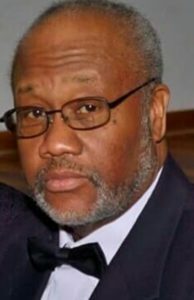 Why the double standard allowing leaders on the left to get away with publicly condoning overt racists like Farrakhan while those on the right are tarred as racist despite their ready and open condemnation of it every time some unknown shows up at their events with a questionable sign? The notion of Tea Party racism continues to be pursued even though black conservatives like myself not only attend these rallies, but are also speakers and organizers. As a leader of Tea Party rallies in the Midwest, I’ve always made it known that it is an open movement. I invite every American to join us out of love for God, country, and a common desire to preserve our Constitution and founding principles. Over the past ten years, I have traveled to and spoken at countless Tea Party events. During this time, I’ve never witnessed a single incident of racism. To the contrary, I have been given several prestigious awards and been the keynote speaker at many movement events. I speak at conferences, write articles and make television and radio appearances to discuss the issues and motivations of the Tea Party movement. 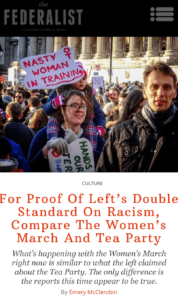 To read Emery’s commentary at The Federalist– “For Proof of the Left’s Double Standard on Racism, Compare the Women’s March and Tea Party” – click here.